by Chuck Kellen, Field Testing Technician/Mechanical Engineer, STIHL Inc. When I joined STIHL Inc. here in Virginia Beach about five years ago, I was really impressed by the different programs and associations that our company supports. As a cyclist, I was particularly interested in the STIHL Tour des Trees. The STIHL Tour des Trees is the primary fundraiser for the TREE Fund, which provides research grants, scholarships and educational programs to help ensure healthy trees. I’ve been cycling for about four years now. My normal riding includes solo trips of 20 to 25 miles and the occasional commute to work. Needless to say, I love everything cycling, but had never taken an opportunity to do a group ride. So in 2011 when the Tour came to our hometown I was jumped at the chance to take part in the STIHL Tour des Trees Ride for Research, a 30 mile fundraising ride. Meeting all the STIHL Tour des Trees riders, new and old, was a great experience. The camaraderie and sense of purpose in the group showed right away. They all obviously enjoy riding, but more importantly they believe in the TREE Fund. 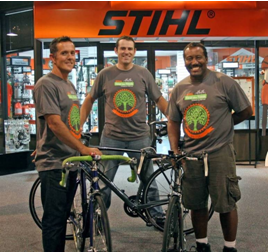 The Monday after the Ride for Research, the STIHL Tour des Trees riders came to STIHL Inc. for a plant tour. I was glad to get a chance to wish them luck and safe travels, but I was kicking myself for not participating in the full Tour. So, along with my friend and colleague, Justin Espy (fellow team rider), I made a commitment to ride in this year’s event in Oregon, all 585 miles of it. Not only am I riding, but I have the honor of being the Team STIHL captain. My other teammates are Robert Jones from shipping/receiving here in Virginia Beach; Mark Hilliard, a territory manager for STIHL distributor Blue Mountain Equipment; Mark Chisholm, a professional arborist with Aspen Tree Expert Co. and spokesperson and education consultant for STIHL; and Brian Noyes, Tree Solutions, who assists Chisholm with training events. 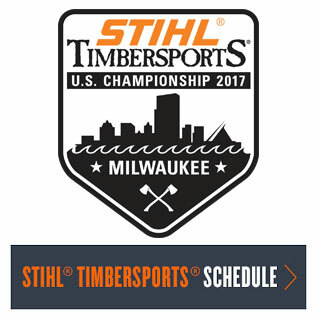 I am really excited to be representing STIHL in this year’s event and to help raise money for the TREE Fund. I can’t wait to get to Portland and get on the road! To follow me on the Tour, visit www.huffingtonpost.com to view my daily blog posts.